SPOKANE, Wash. (KHQ) – Sarah Gillespie took one look outside her Spokane, Washington home Tuesday and saw what the rest of the city did: snow. However, Gillespie saw something completely unexpected: her 98-year-old neighbor, Mac, snowblowing her sidewalk. “I looked out my window and there was Mac… Snowblowing my side of the sidewalk, the whole block, without being asked,” Gillespie said. It shouldn’t be a surprise that Mac is more than willing to lend a helping hand: he served our country during World War II. 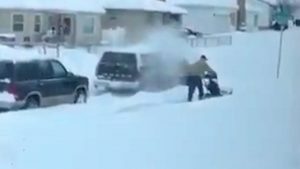 “He’s a national hero, but he’s my local neighbor hero because I don’t have a snowblower. I don’t know how to use one,” Gillespie said. So, other than the fact that he’s being an amazing neighbor…why did Mac do it? “Well, somebody’s got to do it,” he said.